Start a pet bakery business if you are looking for a home-based business idea...especially one that is recession-proof. Do you enjoy baking and decorating baked goods? Pet owners spend over $50 billion yearly. Many pet lovers consider their pets to be part of the family. Actual research has proven that pets are good for us! Research studies have shown that owning a pet can reduce stress and lower blood pressure. Pets offer companionship and psychological stability, two factors important in lowering heart disease in humans. Loneliness and depression are alleviated by owning a pet. Plus, pet owners will often have not one, but two dogs, two cats, or a dog and a cat so that the pets are not lonely themselves! Our pets need care, food, toys and....pet treats! The dog treat business is booming. Dog bakeries have sprung up not only in large cities, but in smaller ones as well, so don't feel limited by your geographical setting. There are dog spas, doggie day care facilities, dog clothing boutiques, and the list goes on. If you are the only one, minimal competition will bring customers quickly to your door. Dog gifts are popular, and dog lovers will often celebrate their dog's birthday...or make one up if they don't know the true date. Just ask a dog lover about the dog and you will be shown photos and told stories about how smart the dog is! So it follows that making dog treats is a booming business. You don't have to open a real dog bakery with a storefront, etc. You could bake for a boutique, or offer dog treats to a dog grooming service for their customers. Dog birthday cakes are a very popular item and dog owners will look for a dog bakery to make custom cakes. 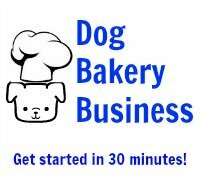 Click here to read about pros and cons for starting a dog bakery business. A business will take time and effort. You will need to understand licensing requirements, dog treat ingredients, marketing, packaging, accounting, and anything else that a business needs to succeed. Click here: Pet bakeries: business tools to succeed to get started. What inventory do you need? 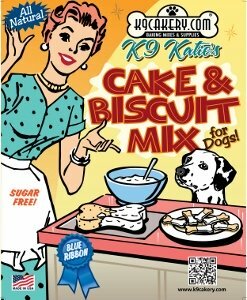 Learn about available cake mix for dogs and other dog treat biscuit mix options.